Just 24 hours stand between me and the weekend right now. To say I’m preoccupied with my impending freedom is an understatement. I really do live for the weekend. A few years ago the arrival of the weekend would have almost definitely have meant a trip to a local take away. When I order an Indian take-away there is one thing I cannot do without, and thats a side of Saag Aloo. It doesn’t make a difference whether I’m ordering a biryani, tandori chicken, or a passanda. It doesn’t even matter if I’ve ordered a pilau rice, a keema naan or both! I HAVE to have a portion of Saag Aloo. 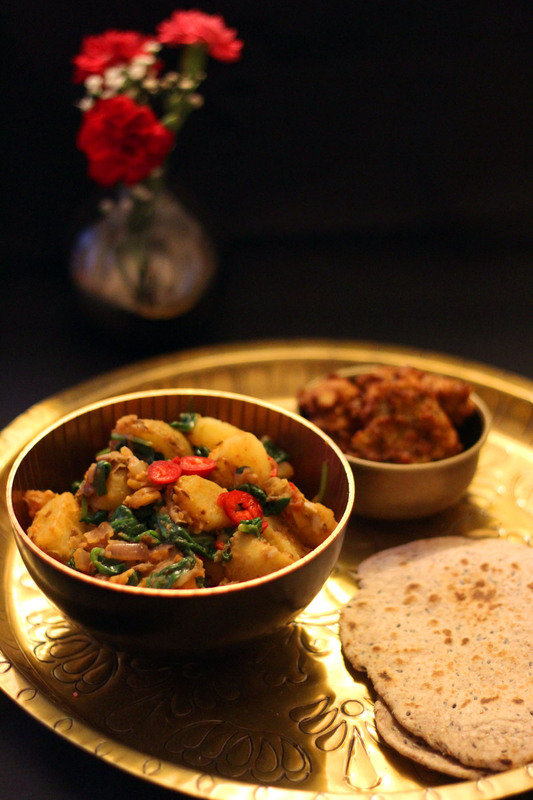 I absolutely love spicy food and there is something about the balance of flavours in a Saag Aloo that I just love. Saag Aloo is a Northern Indian dish made up of spinach (Saag) and potatoes (Aloo). the spices I’ve used are also pretty authentic but there is one thing missing which is used in almost all Indian recipes – ghee. For those of you who don’t know, ghee is clarified butter that originated in ancient India. What is meant by clarified butter is that it has had its milk solids removed. Ghee features in most authentic recipes that you will find on the internet but as its not easily available across the UK I’ve done my best to leave it out whilst keeping the taste the same. I hope you enjoy! 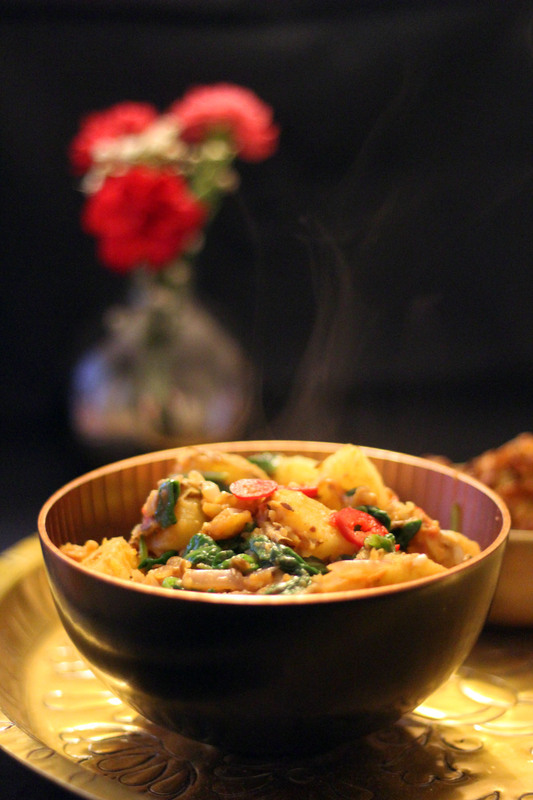 Try my take of a curry house classic - saag aloo - made with British new potatoes! Gently fry the onion, spices, and the garlic cloves, for roughly 5 mins. Once the onion has softened add the chilli. Check the potatoes have begun to soften drain them, and slice so they are about 1cm thick. Put them into the spice and onion mix to fry for 10mins along with half of your spinach. When the potatoes have taken on the flavour of the spices add the rest of the spinach and the tomato (chopped) and allow to cook for no longer than 5 mins. It is now ready to serve! Having “take away style recipes in your repertoire is an essential for me. They’re not only healthier but they are kinder on your purse too. I dread to think how much I’ve spent at the local curry house over the years. One of the best examples of this is my recipe for Chinese Fakeaway Ribs! Of course the take away has a certain charm and when you have to walk past it on the way home like I do the convenience is a real draw. 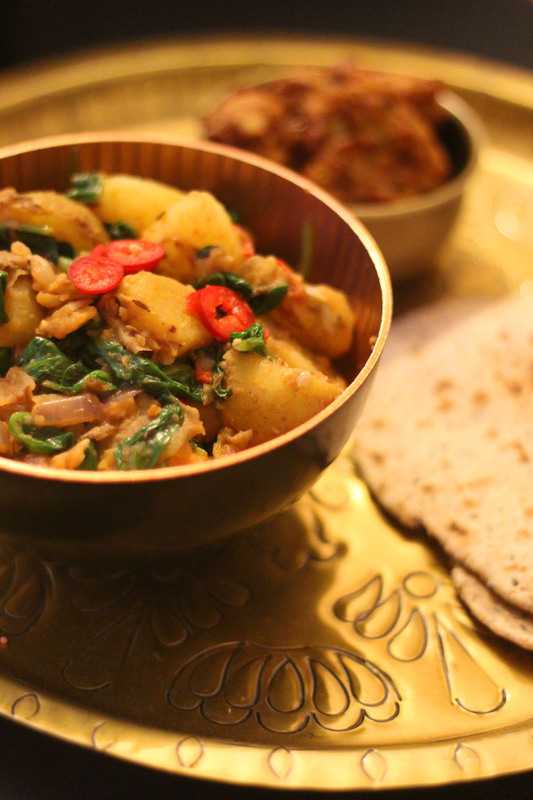 But try this saag aloo recipe next time you cook yourself a curry and I’m sure it will not disappoint! Is there a certain dish you can’t live without when ordering a take away? Have you come up with any take away style recipes? I’d love to hear in the comments below. I followed you from the foodie blog roll and I'd love to guide Foodista readers to your site. I hope you could add this potato widget at the end of this post so we could add you in our list of food bloggers who blogged about potato,Thanks! I love sag Aloo and always have it with my takeaway curry too. Often I have 2 sides instead of a main. Ghee is so easy to make at home and even better you can use te best butter you can get your handa on to make it! Yum. Hi Ceri! I’d never even thought of making it myself! What a fantastic idea 🙂 I love that you have two sides too. I hate being constrained – more dishes is always better! Thanks Camilla – I was quite proud of capturing the steam though it was perhaps more luck than skill haha! I found your post on Pinterest and I had to come over and tell you your photos are lovely! You really make me feel like I’m in an Indian restaurant about to enjoy something exotic and delicious. Hi Gin! How wonderful that my photo on Pinterest lured you in! I’m glad you like it 🙂 do have a look around as there’s plenty more where this one came from!